“My dear Noël, I don’t know what to write you, so I shall tell you the story about four little rabbits..."
Beatrix Potter took inspiration from her pet rabbit, Peter Piper, for her beloved character, Peter Rabbit. In 1893, a twenty-six year old Beatrix wrote an illustrated letter to her former governess’ son, Noël, who was ill and confined to bed for months. The letter began, “My dear Noël, I don’t know what to write you, so I shall tell you the story about four little rabbits, whose names were Flopsy, Mopsy, Cottontail, and Peter…”.1 Seven years after sending this letter, and after a few years of working with publishers to create greeting cards, Beatrix was inspired to publish her tales of Peter Rabbit and his friends. 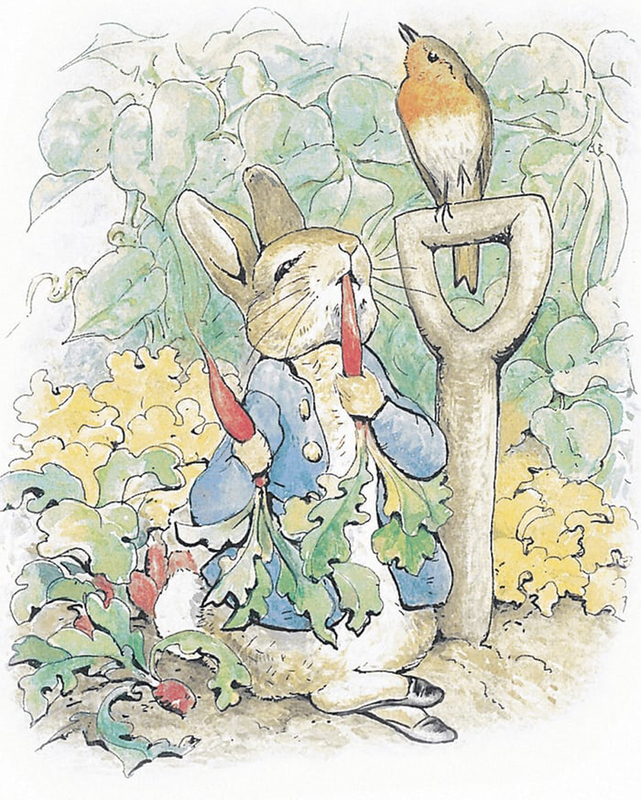 Her manuscript of The Tale of Peter Rabbit was met with many rejections from publishers, so Beatrix decided to print the book herself. Beatrix’s design for her first book was meant to suit young readers, with one to two lines of text and a single illustration on each page, bound in a small format. Originally printed in black and white for the Christmas holidays, the book sold out by December and was still in high demand. This caused publishers Frederick Warne & Co. to reconsider their rejection, and asked Beatrix to reproduce the story in color. This request marked the start of Beatrix’s beautiful watercolor paintings that accompanied each tale. 1. Susan E. Meyer, A Treasury of the Great Children’s Book Illustrators (New York: Harry N. Abrams, 1987), 132.